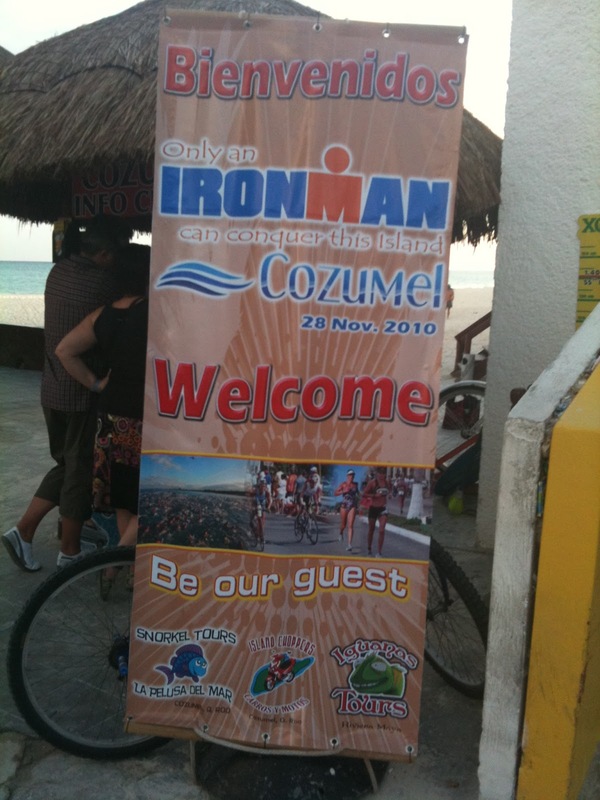 you gotta want it: Ironman Cozumel - We're here!! While many of you reading this may be cozied up inside at work or at home on Thanksgiving break, I'm sitting on the (man-made) beach at the Cozumel Palace sipping on some delicious mexican coffee, enjoying an almond pastry, and watching the waves crash. 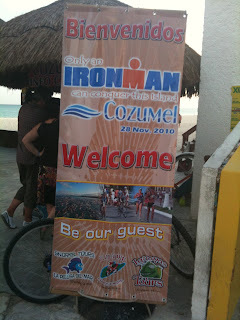 This is known as "prep" for Ironman Cozumel, which is this Sunday. Not a bad way to escape the beginning of a LONG winter ahead in the Midwest! Getting here we had our ups and downs. First of all, Dan and I were able to buy a DOUBLE airline bike case from a friend for a VERY good price- SWEET! Considering how much we travel for races (and the crazy prices to travel with your bike), we were definitely ecstatic! When Dan's parents and I arrived at the airport yesterday morning (Thanks Mom for driving us! ), the first thing that Dan and I were NOT looking forward to was paying for our 2 suitcases and our bike case. *Sigh*. FORTUNATELY, we had a VERY friendly US Airways service rep at 4:30AM, and (with a little help from his military status) checked all bags for FREE!! GREAT way to start off the morning! 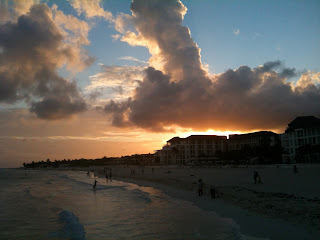 The flights to Cancun went off without a hitch (except for the REALLY drunk guys sitting behind us lol). One VERY exciting thing happened though: I got an early Christmas present from Dan!! It was wrapped up and everything, and he got me a brand NEW Garmin 310XT!! I had JUST bought a used 305 from a friend since Winston chewed up my old one, so I was ECSTATIC to get this fancy schmancy new watch to use for Ironman Cozumel. Now HE gets the 305 :) YAY! Funny story: I set the watch to "autolap" in the "Other sport" setting (i.e. swimming) every .25 miles. They Dan and I decided to check out the stats for our plane - to see how high we were (40.000 ft) and how fast we were going (545 mph)- Cool! But when I pushed "START" to track it on a graph, the watch starting beeping and vibrating like CRAZY because it was alerting us every .25 miles! AAH! I couldn't get it stop because while it was alerting it wouldn't let me change settings, so I finally turned the device off. We traveled 5.55 miles during the time...so you can imagine how obnoxious the watch was LOL!! While retrieving our luggage in Cancun, we found out our bikes somehow ended up on a flight to Charlotte, and were arriving in Cancun on a different flight an hour later. We couldn't leave and come back into the airport, so we waited... not fun. But we got it. With at least one broken latch. :( At least it was free. The Palace Resorts arranged a van to pick us up and drive us to Playa del Carmen, provided tickets for the ferry to Cozumel, and another taxi drove us to the Cozumel Palace, which was very convenient and gave us one less thing to worry about. After the 45 minute drive to Playa del Carmen from the airport, we stopped at the Playa del Carmen Palace to relax while we waited for the next ferry which was to leave in an hour (there are ferries that leave every hour). We had some tasy food and checked out the resort. 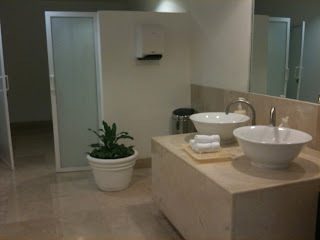 It had a very nice beach, and very cool modern decor! One nice thing with the Palace resorts is that they are all-inclusive, and with your wristband, you can visit ANY resort and take advantage of their food and facilities. 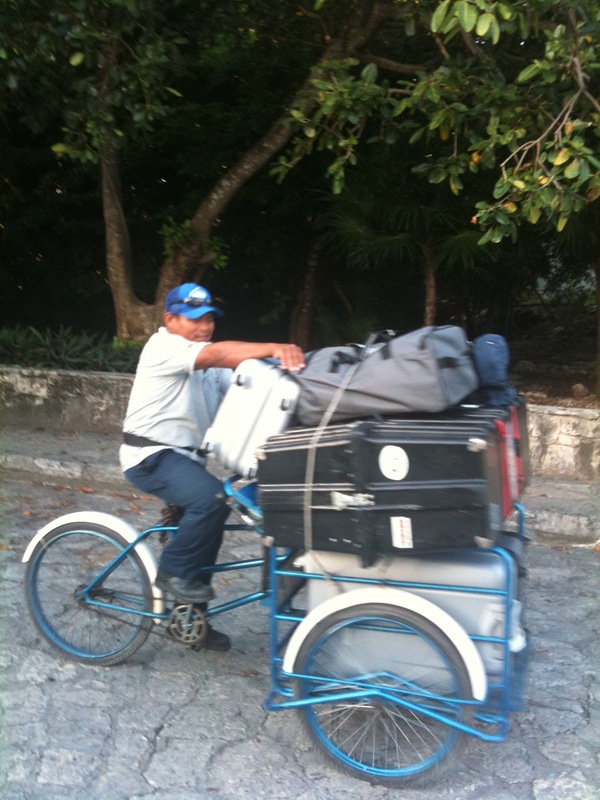 The Palace guys were nice enough to transport our luggage to the ferry: CHECK IT OUT!! There were quite a few athletes arriving today: Several bike cases were on our plane (even though ours wasn't lol) and there were a lot on the ferry! Ferry ride was also about 45 minutes. If you are in an area that has free WIFI (ie your resort), turn WIFI "ON" and connect You can use all the apps that require internet access on your phone- ie facebook, etc. Download a "free text and pictures" app- they assign you a "phone number" and now you can text and send pictures to any US Cell phone for no charge. I think some might even let you call! this is how I'm staying in touch with my family. How exciting! I'm waiting to hear all about it ! Very cool, keep the updates coming! Good luck this weekend! I know you'll do awesome! Oh and enjoy the fabulous vacation! Good luck Laura! I would use the 808, but that's just me. Love that wheel. Hammer it! Happy Gobble Gobble Day to you all. We are going to miss your presence at the table, but will remember you all in our prayers! I hope that you do well in your race. We'll be with you on Sunday. Good luck. Love Ya, KiKi, Uncle Dan and Singlei! Oh yeah, Mia, Einstein and Penelope too! In hindsight, Instead of downloading a "free text" app, just use the SKYPE app on your phone or use it on your computer!